It will sometimes run this load for hours before tripping. Sometimes, after reset, it trips within minutes and sometimes it goes for another hour. It has been a while since I have had the electrical panel cleaned and checked. Voltage as read on the driver's side electrical outlet looks fine. Any idea what I should check first? The heat behind the circuit breaker may be from your converter. If the breaker feels warm, this may indicate a loose connection or a bad breaker. Screws do loosen up so you need to check that all your wiring connections are tight. There should be a metal plate that holds the breakers in place. Removing the plate will give you access to the wiring. Make sure there is no power to the coach. Unplug the A.C. cord, turn the battery disconnect switch off, and generator off. While everything is exposed, you might as well tighten everything. Thank you so much for such a clear explanation !!! I will do this !! .... but it does tell me that I'll need to get the electrical wires checked and the one in question replaced !! While getting the fuse checked also. Will call my RV repair guy !! We bought a four year old Bounder. After owning it for about a year I opened the electrical panel and found discolored wires due to over heating. It turns out that it's relatively easy to get overheating. Copper wires, steel screws, possibly aluminum bus bars plus travel vibration, all a formula for high contact resistance and heating. At the time I was on the Bounder forum and posted my concerns of a potential fire problem. A number of people posted the same problem. My suggestion was the use of No-ox on all wires and yearly loosening and re-tightening of the screws. We owned the Bounder for another 7 years and had no further problems. P.S. I would say two white wires are burnt. 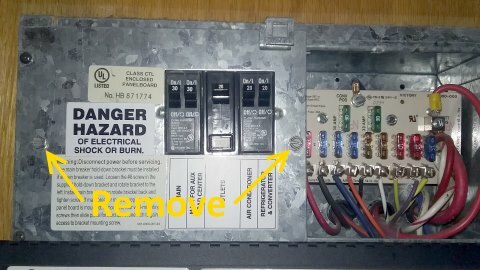 I recently replaced my convertor and totally rewired my panel, Each black wire now has it's own circuit breaker and no ganged white return wires. Thanks Norm - Great suggestions re the no-ox and doing a re-wire to isolate each black wire with its own circuit breaker. I am going to suggest this to my RV mechanic next week. I need to go pull out a circuit diagram to understand the purpose of those white return wires!! Unless something is really strange in the wiring, like 3 15 amp circuits having their white return wires tied together into a single white wire, I believe the heating comes from high contact resistance. Next time you have the problem you can feel the return white wire bus for heating. Basically the way the AC distribution works, the Breaker array provides power to the black wires. The breakers only pop if the current thru the black wire exceeds the rating of the breaker, This can also be caused by the breaker heating up. As well breakers are not forever and can simply fail with time. The black wire from the breaker goes to the load, like the refrigerator, and returns through a white wire. Basically the white wire carries the same current as the black wire. The white wire should only heat up for one of two reasons, one it is carrying too much current which should trip the breaker or two, the contact resistance is too high caused by the end of the white wire not making good contact to its metallic buss bar. If the white wire's associated black wire has not melted as well it's not caused by too much current because current that flows thru the white wire most also flow thru the black wire. Looking at your picture it does look like your wiring does have some white wires tied together as witnessed by the three wires with electrical tape on them. Normally each white wire should go to it's own screw, particularly since you have unused screws. Wow - So basically each white wire should close a black wire circuit but the whites are instead tied together. 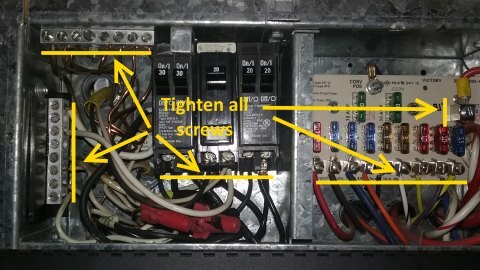 I will have my RV guy rewire as separate circuits. Thank you for this amazingly valuable info.